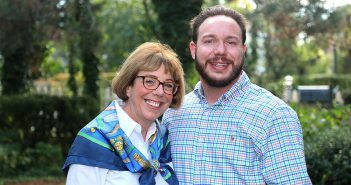 For the Harman family, Fordham’s 2017 commencement was the third installment in a sister act. Shannon Harman graduated from the Gabelli School of Business on May 20, just like two of her sisters before her. Abigail (Abby) Harman earned her Gabelli diploma in 2016, and Emily Harman graduated from the school in 2015. 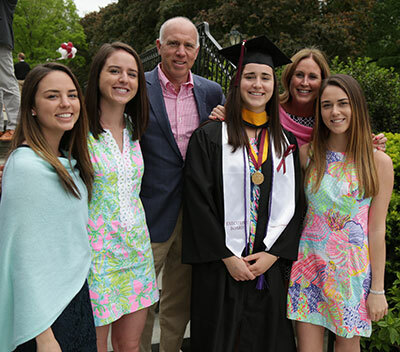 Having her two older sisters on campus with her was helpful, said Shannon, standing outside the Rose Hill Gym with her family just before the Gabelli ceremony, where Abby and Emily joined her on stage as she received her diploma. “I got to know a lot of people over the years, especially having two sisters [here] before me,” Shannon said, adding that watching her siblings navigate Fordham’s classes and extracurriculars helped her pursue her own path toward a career in finance. Shannon followed in her sisters’ footsteps in some key activities during her Gabelli career. She was CEO of Smart Woman Securities, where Emily had also served as CEO and Abby was chief development officer, hosting weekly seminars with finance professionals who shared advice and career perspectives. The nonprofit organization, with chapters on several college campuses, aims to educate undergraduate women on finance and investing through networking events and mentoring. Each of the Harman sisters attended the organization’s annual trip to Omaha, Nebraska, where they were among a group of students who met and dined with Warren Buffett. “One of my favorite things here was being in Smart Woman Securities. That really helped me grow,” Shannon said. “And it actually helped me get my job, because of one of the events they helped me attend.” In July, she’ll be starting a rotational finance program at JPMorgan Chase, where she interned as a student. All three sisters studied abroad with Gabelli at Fordham’s London Centre. Emily said that learning what it was like to work in finance in London, as well as connecting with Fordham’s alumni network there, gave them each valuable international perspective. “It had a huge impact on my Fordham experience,” she said. Emily started her career in BNY Mellon’s Emerging Leaders Program before moving last summer to Blackstone, where she is an analyst in the Private Wealth Group. Abby is also currently at Blackstone in the rotational finance program, a position she landed after completing the summer internship there in 2015. 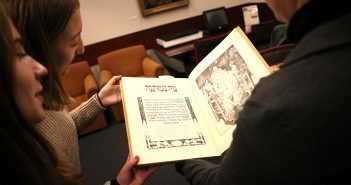 Though the three sisters ended up together at Fordham, they went their own ways in high school. The family lives in Brielle, New Jersey, and they each went to a different specialized high school in the Monmouth County Vocational School District. The fact that they attended separate high schools gave them a greater appreciation for the time they spent together at Fordham. Their youngest sibling, Gracie, is currently a junior in Manasquan High School, where she is part of the finance academy. The family affectionately refers to her as a potential Fordham Ram. “I’d love to see her come to Fordham and have a great experience like we did,” Emily said.